2 of 3 Meanwhile, add pork chops to oil in skillet and cook 4 to 6 minutes, depending on thickness, turning once. 3 of 3 While pork cooks, whisk broth, soy sauce, vinegar, sugar, sesame oil, ginger, garlic and cornstarch. Remove pork to a cutting board and reduce heat under skillet to medium-high. Add snow peas, red pepper and carrots to skillet. Cook 3 minutes. Add broth mixture; bring to a simmer and cook 2 minutes. Slice pork into strips. 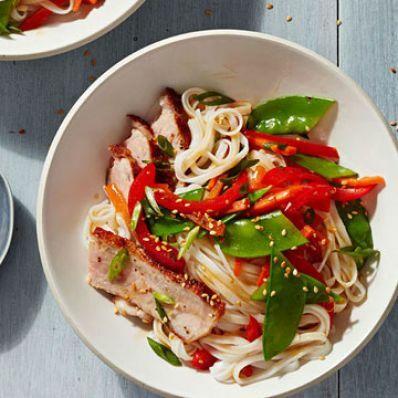 In a large bowl, toss noodles, pork, contents of skillet, scallions and sesame seeds and serve.